My oldest made his own sandwich today. While that might not seem like a big deal, it is in my household. I live with three males. Most days there are dirty socks, dishes and messes all around my house. I have been working with my kids to make them more responsible. When I am in the middle of ten different tasks it can be hard to drop everything to make my kids a glass of milk, a sandwich you name it. When my son came into the living room with a perfectly cut and made sandwich I was happy, but assumed I would walk into a mess in the kitchen. After walking into the kitchen I was more than a little surprised. The counters were wiped down, the bread and sandwich ingredients put away and the kitchen looked cleaner than I had left it. There are many moments during the day that I feel like I try teaching my kids and nothing sinks in. Then there are days like today where I know that I am at least doing something right. I am a big snack eater. My kids have inherited this trait and we go through a ton of snacks every week. I try to keep the snacks I make healthy and with protein so my kids stay fuller and don't have sugar crashes. This week I tried a new recipe for Homemade Smoked Almonds from the Taste of Home website. This recipe has six ingredients. It takes 45 minutes of total time, 15 minutes of which is active and makes 9 servings. I followed this recipe pretty close to the original. The only changes I made were to add 1 teaspoon of liquid smoke instead of a 1/2 teaspoon. My liquid smoke was a little old and had lost some of its flavor so I figured adding a larger amount would be a good idea. Make sure to stir the nuts every 10 minutes so they get evenly browned and salted. While this recipe states the almonds are smoked, they are more flavored than smoked. The main flavor that comes through is garlic. They are still delicious and my boys and I ate the whole batch. If you want a stronger smoke flavor you might want to adjust the amount of liquid smoke and garlic powder. However, I liked the almonds as written, the garlic flavor was delicious and made for a nice salty afternoon snack. For the recipe go to Homemade Smoked Almonds. I LOVE smoked almonds. I've never thought of making them from scratch, though. These sound easy and delicious. Thanks for sharing. I love them too :) This recipe is actually really easy, which I love! haha, the kids surprise us sometimes...but when they do (in my house) it's usually because they want something!! loving these almonds. i'm doing my best to keep the snacks healthy...mostly lots of fruit. I've been trying to keep healthy snacks too. Especially with my kids, too much sugar makes them way too hyper!! 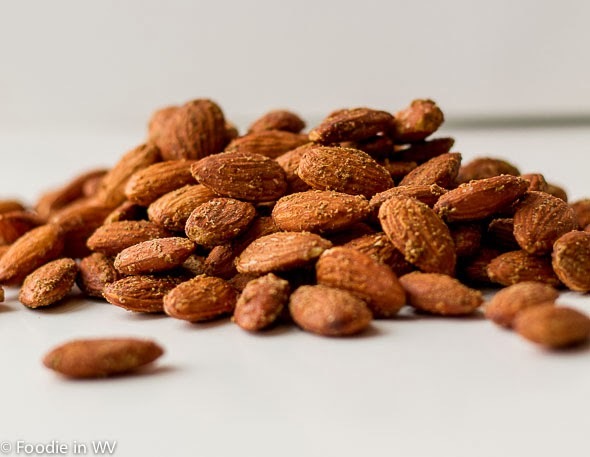 Almonds are one of my favorite snacks, they are high in protein and yummy! Hahaha, it's a huge deal when they do something for themselves. I live with all males, too, so I totally get it. Hello, my name is Francesca and I'm Italian. I stumbled upon your blog and I liked it because there are so many recipe. I have joined your supporters. If you go too foul. Thank you. I've never had a smoked almond but I want to! I'm off to check them out. They turned out pretty well, they were a nice afternoon snack! I snack on almonds and these look wonderful... and perhaps maybe you thought you were in the twilight zone with the clean kitchen - that's what I used to think with my kids :-) Have a good week! I love snacking on almonds too. They are a nice heart healthy, protein snack!